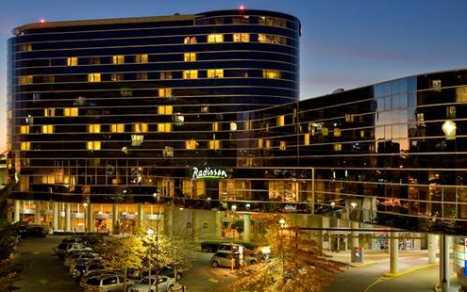 The Radisson Hotel is centrally located in Richmond and steps away from the Canada Line, a rapid rail transit offering connections to Vancouver International Airport and Vancouver downtown. The hotel provides 12 conference rooms within a 16,000 sq. ft. space, 200 guestrooms, Nautilus-equipped Fitness Centre, whirlpool and indoor pool, restaurant and lounge, 24-hour self-service business centre with free Internet access, complimentary airport shuttle and complimentary wireless high-speed Internet access in guestrooms. A deluxe full-service conference hotel, the Radisson Hotel Vancouver Airport offers exceptional comfort and convenience to business and leisure travelers alike. Steps away from the rapid rail transit to the airport and Vancouver downtown.